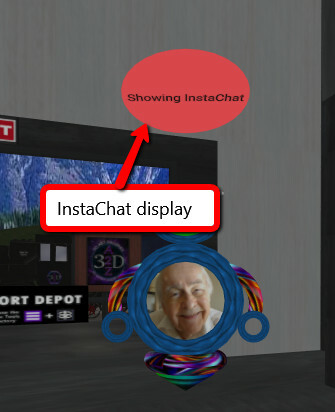 InstaChat makes for quick communication in 3DWebWorldz. Makes it easy to ask questions or give information. The InstaChat button toggles the display on and off. When toggled, the display loses its contents. To keep text inside the "bubble," hit ENTER before text runs out of the text bar. To check your display use the mirror button. InstaChat displays above the avatar. Students can use it to ask questions quietly. Instructors can use it to answer questions. Welcomers can use it to give starting instructions to newcomers. The text always faces the camera. So each user sees it face on. The bubble is red in this display, but will be white in the next update. Web-world: Marketing. Selling your product in 3 dimensions.